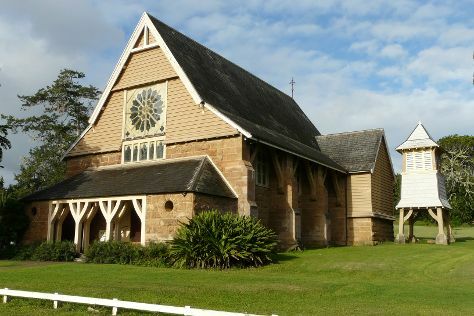 On the 8th (Wed), take in the architecture and atmosphere at St. Barnabas Chapel, contemplate the long history of Kingston and Arthur's Vale Historic Area, then kick back and relax at Emily Bay, then stroll the grounds of Norfolk Island Cemetery, and finally don't miss a visit to Fletcher's Mutiny Cyclorama. On your second day here, steep yourself in history at The Salthouse, kick back and relax at Point Ross, and then take in the awesome beauty at Mount Pitt. To find other places to visit, photos, ratings, and other tourist information, you can read our Norfolk Island trip planner . Reykjavik, Iceland to Norfolk Island is an approximately 34-hour flight. Traveling from Reykjavik to Norfolk Island, you'll lose 11 hours due to the time zone difference. Prepare for much warmer weather when traveling from Reykjavik in January: high temperatures in Norfolk Island hover around 28°C and lows are around 22°C. Cap off your sightseeing on the 9th (Thu) early enough to travel to Port Macquarie. Visiting Dolphin & Whale Watching and Koala Hospital will get you outdoors. Get some cultural insight at Smoky Cape Lighthouse and Trial Bay Gaol. You'll find plenty of places to visit near Port Macquarie: Pilot Beach (in Camden Head) and Maritime Museum South West Rocks (in South West Rocks). Next up on the itinerary: visit a coastal fixture at Tacking Point Lighthouse, trek along Coastal walk, and explore the wealth of natural beauty at Sea Acres Rainforest Centre Port Macquarie. 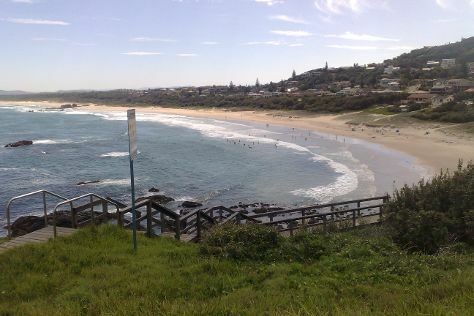 Make your Port Macquarie itinerary with Inspirock to find out what to see and where to go. Traveling by flight from Norfolk Island to Port Macquarie takes 8 hours. Alternatively, you can do a combination of flight and train. Traveling from Norfolk Island to Port Macquarie, you'll gain 1 hour due to the time zone difference. In January, plan for daily highs up to 26°C, and evening lows to 23°C. Cap off your sightseeing on the 12th (Sun) early enough to travel to Sydney. 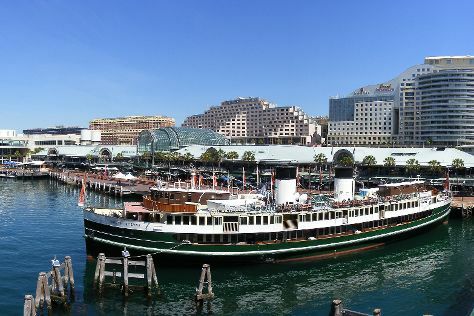 The Rocks and Darling Harbour are good opportunities to explore the local culture. Get outdoors at Manly Beach and Featherdale Wildlife Park. Next up on the itinerary: kick back and relax at Bondi Beach, contemplate the long history of Vaucluse House, stroll through Clovelly Beach, and catch a live performance at Sydney Opera House. To find where to stay, photos, traveler tips, and more tourist information, refer to the Sydney trip itinerary site . You can fly from Port Macquarie to Sydney in 3.5 hours. Alternatively, you can drive; or do a combination of bus and flight. Expect somewhat warmer weather when traveling from Port Macquarie in January: highs in Sydney hover around 32°C, while lows dip to 23°C. Finish your sightseeing early on the 15th (Wed) to allow enough time to travel to Hobart. Discover out-of-the-way places like Hobart Convict Penitentiary and Tasmanian Museum and Art Gallery. 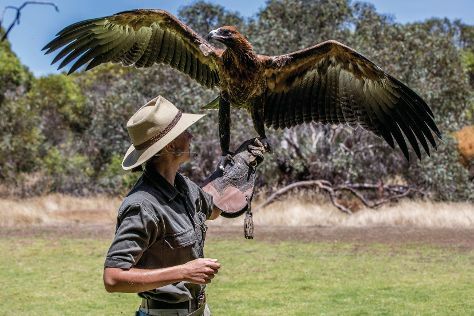 Escape the urban bustle at Kayaking & Canoeing and Bonorong Wildlife Sanctuary. Next up on the itinerary: sample the tasty concoctions at Cascade Brewery, kick back and relax at Opossum Bay Beach, take in the waterfront at Constitution Dock, and take in the awesome beauty at Mount Wellington. To see ratings, photos, reviews, and more tourist information, you can read our Hobart trip itinerary builder app . You can fly from Sydney to Hobart in 4.5 hours. Alternatively, you can do a combination of train, ferry, and bus; or do a combination of bus and ferry. Traveling from Sydney in January, expect Hobart to be slightly colder, temps between 26°C and 14°C. Wrap up your sightseeing on the 18th (Sat) to allow time to drive to Bicheno. Bicheno is a town on the east coast of Tasmania, Australia, 185 km north-east of Hobart on the Tasman Highway, with a population of 853. You'll explore the less-touristy side of things at Nature & Wildlife Tours and East Coast Natureworld. Get outdoors at Dolphin & Whale Watching and Wineglass Bay Lookout. Explore Bicheno's surroundings by going to Kings Fine Art Gallery (in Dolphin Sands), Spiky Beach Conservation Area (in Swansea) and Spring Vale Wines (in Cranbrook). There's still lots to do: do a tasting at Devil's Corner Cellar Door and stroll through Denison Beach. To find where to stay, reviews, more things to do, and tourist information, you can read our Bicheno trip planning website . You can drive from Hobart to Bicheno in 2.5 hours. Alternatively, you can take a bus. In January, daytime highs in Bicheno are 28°C, while nighttime lows are 12°C. Wrap up your sightseeing on the 21st (Tue) to allow time to drive to Cradle Mountain-Lake St. Clair National Park. 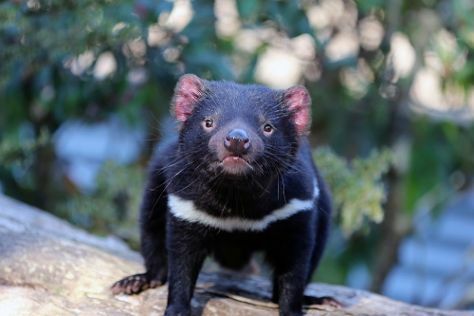 Kick off your visit on the 22nd (Wed): admire the sheer force of Pencil Pine Falls and Knyvet Falls, explore the activities along Dove Lake Circuit, and then look for all kinds of wild species at Devils @ Cradle. Get ready for a full day of sightseeing on the next day: look for all kinds of wild species at O'Neills Creek Picnic Reserve and then take in the dramatic scenery at Bridal Veil Falls. For photos, maps, reviews, and other tourist information, read Cradle Mountain-Lake St. Clair National Park trip planner . Drive from Bicheno to Cradle Mountain-Lake St. Clair National Park in 5 hours. Alternatively, you can do a combination of bus and car. 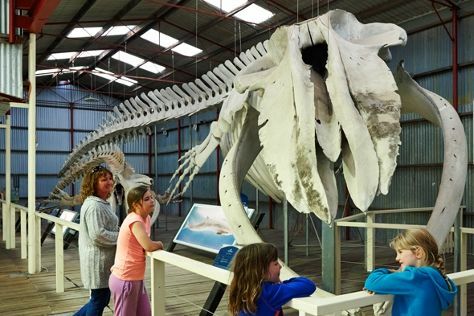 Wrap up your sightseeing on the 23rd (Thu) early enough to travel to Port Campbell. Port Campbell is a coastal town in Victoria, Australia. 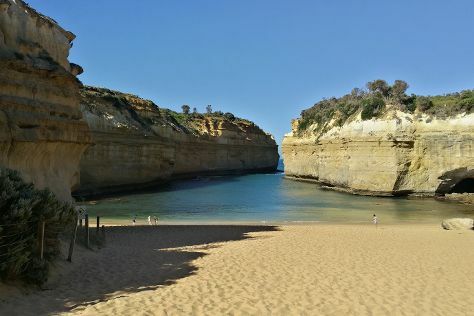 Step off the beaten path and head to London Bridge and Port Campbell National Park. Step out of the city life by going to Otway Fly Treetop Adventures and The Razorback. There's much more to do: explore and take pictures at Loch Ard Gorge, take in the dramatic natural features at Twelve Apostles, and make a trip to Gibsons Steps. To find reviews, maps, other places to visit, and tourist information, you can read our Port Campbell itinerary builder app . Traveling by combination of car, flight, train, and bus from Cradle Mountain-Lake St. Clair National Park to Port Campbell takes 11.5 hours. Alternatively, you can do a combination of car and ferry. 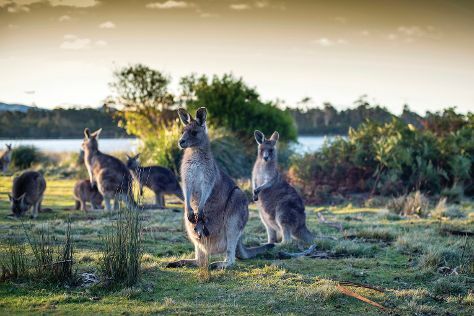 Wrap up your sightseeing on the 26th (Sun) to allow time to travel to Kangaroo Island. Step off the beaten path and head to Paul's Place Wildlife Sanctuary and Stokes Beach. Escape the urban bustle at Hanson Bay Wildlife Sanctuary and Raptor Domain. Spend the 28th (Tue) exploring nature at Flinders Chase National Park. The adventure continues: look for all kinds of wild species at Seal Bay Conservation Park and don't miss a visit to George's 40,000 Castle Lights. To find photos, maps, traveler tips, and other tourist information, go to the Kangaroo Island sightseeing website . Do a combination of car and ferry from Port Campbell to Kangaroo Island in 10.5 hours. Alternatively, you can do a combination of bus, train, and flight; or do a combination of bus and flight. Cap off your sightseeing on the 29th (Wed) early enough to travel to Albany. Eschew the tourist crowds and head to Little Beach and Middleton Beach. Take a break from the city and head to Cheynes Beach and Betty's Beach. Next up on the itinerary: take an in-depth tour of Albany's Historic Whaling Station, admire the striking features of The Church of Saint John the Evangelist, contemplate the long history of Princess Royal Fortress, and take in the dramatic natural features at The Gap and Natural Bridge. To find where to stay, more things to do, photos, and more tourist information, use the Albany online tour itinerary maker . You can fly from Kangaroo Island to Albany in 9 hours. Another option is to do a combination of flight and bus. Traveling from Kangaroo Island to Albany, you'll gain 1 hour due to the time zone difference. In January, daytime highs in Albany are 29°C, while nighttime lows are 16°C. Wrap up your sightseeing on the 1st (Sat) early enough to drive to Margaret River. Get some historical perspective at Hamelin Bay Jetty and Cape Leeuwin Lighthouse. 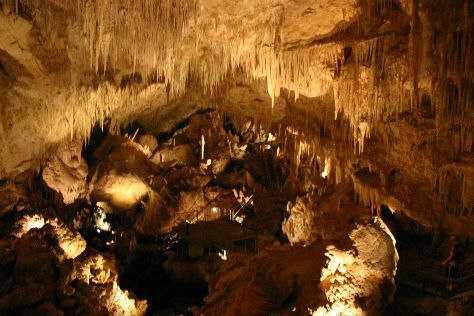 Discover out-of-the-way places like Meelup Beach and Mammoth Cave. Explore the numerous day-trip ideas around Margaret River: Boranup Karri Forest (in Australia Plains), Yallingup (Canal Rocks, Ngilgi Cave, & more) and Augusta (Jewel Cave & Water wheel). There's much more to do: enjoy the sand and surf at Hamelin Bay, do a tasting at Happs Winery and Cellar Door, take in the dramatic natural features at Sugarloaf Rock, and take a memorable drive along Caves Road. To see ratings, maps, traveler tips, and tourist information, read our Margaret River trip builder tool . Traveling by car from Albany to Margaret River takes 4.5 hours. Alternatively, you can take a bus; or do a combination of flight and bus. Finish up your sightseeing early on the 8th (Sat) so you can travel back home.